This ultra-slim keyboard combines premium materials with a stylish design. Made from brushed stainless steel and an aluminum alloy, the housing is not only robust and sturdy - it also adds a touch of style to any desktop. 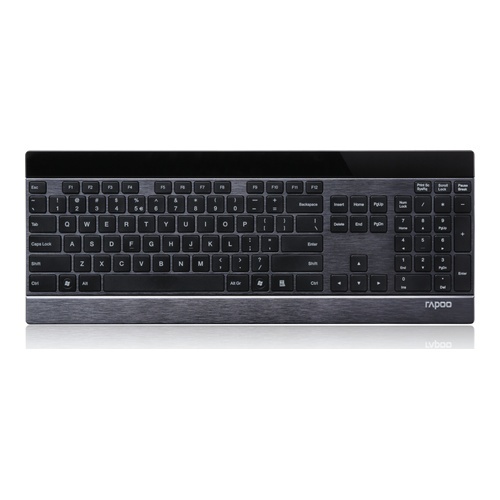 The E9270P is equipped with illuminated multimedia touch keys which make accessing all-important multimedia functions quick and easy. The touch keys light up as soon as your hand gets close to the sensor area, so there’s nothing to stop you using them even in complete darkness. This ultra-slim keyboard combines premium materials with a stylish design. Made from brushed stainless steel and an aluminum alloy, the housing is not only robust and sturdy - it also adds a touch of style to any desktop.